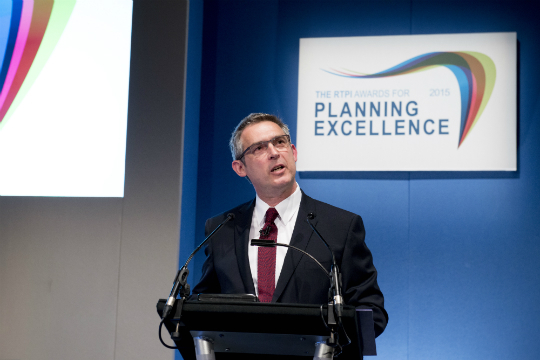 Kevin had the privilege of hosting the RTPI Awards for Planning Excellence for a second time in July 2015. After the success of 2014, the awards had more entries, more finalists, and even more demand for tickets – it was sold out after only 4 weeks! The judges clearly had a very hard time, as the calibre of entries across all categories was extremely high, with many finalists who might have been winners in previous years. Presdient Janet Askew welcomed Head judge, and former Government Minister, Nick Raynsford, who was most impressed by the standard, and the rigour of the process. The event was great fun, with lots of excitement, but we had to keep moving to get through all fourteen categories in time for the celebrations – see the pictures here. Some of the highlights for me included Merthyr Tydfil winning in the public realm category and Viral Desai winning Young Planner of the Year. I was also pleased to see the Scottish Government’s National Planning Framework 3 (NPF3) pick up an award and commendation, as we had been directly involved in running stakeholder workshops for them when they started their process. The Jubilee Cup Winner for 2015 was Thames Tideway Tunnel, an amazingly complex and intricate infrastructure project that set new standards in engagement within the new Nationally Significant Infrastructure Projects (NSIPS) process. The full list of winners is in the Awards brochure. Thanks again to the great RTPI events team, all the sponsors, judges and, of course, all the category finalists for their contribution to a great evening.